To track one of your orders, enter the Order Number you received in your confirmation e-mail and your Last Name. Alternatively, you may sign in to My Account to view your complete Order History including the status of all of your orders. 1. My order hasn't arrived yet, why? 1. I am not able to view my order status. What should I do? 2. The order status hasn't changed since the last time I checked, what's going on? 3. Is my order shipped yet? 1. How do I track my package once it is shipped? 2. Where do I get more detailed tracking information? 1. My order was not delivered, what should I do? 1. Q: My order hasn't arrived yet, why? A: During high traffic seasons, holidays or weekends, packages get backed up at the Hong Kong Post Office. This usually causes minor delays of one to four days. Delays can also occur at destination port of entries. The number of days vary for each country and each situation is different. While most packages normally arrive within 5 to 10 days, it could take up to 14 to 16 days in some special cases. You may use the tracking number provided to check with your local post office if any packages are being withheld. We ship orders out as soon as your entire order is at hand, and 99.95% of our orders arrive at their destination in satisfactory time. 1. Q: I am not able to view my order status. What should I do? A: Once you checkout through Paypal or Google, a confirmation email will be sent to you. You may use the AsiaTees Order ID (ATXXXXXXXX) together with your last name to track your order on this page. The AsiaTees Order ID can also be found by logging into My Account. To view your complete order history, you must create an account using the same email address as the payment email when you checkout. If you are still unable to view your order status, please feel free to contact us. 2. Q: The order status hasn't changed since the last time I checked, what's going on? A: When the order status is idle at "Preparing order for delivery", this means that not all items are immediately available for shipment. Please be patient as we process all items you ordered to get your shipment to you intact. As promised, this would not take more than four days. If we are unable to obtain all the products in your order, we will send you a refund for such items. 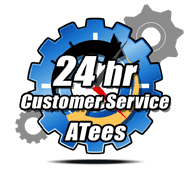 The order status on ATees.com provides order status information beginning from the time of checkout, to shipment from Hong Kong. Further tracking can be done by checking your local postal office website. 3. Q: Is my order shipped yet? A: You may check the order status by entering your AsiaTees Order ID and last name in the above form. Once your order is shipped an email with tracking information is sent to your payment email. 1. Q: How do I track my package once it is shipped? For Express Mail Saver shipping method, tracking information will only indicate the package has left Hong Kong for its destination. It could take up to five days from shipment date for the Hong Kong Post Office to upload the shipment status. More detailed tracking information may be available by using the tracking number emailed to you through your local post office's website. 2. Q: Where do I get more detailed tracking information? A: For United States customers, you may track on USPS.com. For other countries, view instructions to track your package. If your local post office does not provide a tracking service for foreign registered airmail parcels, you will not be able to track the package in detail. 1. Q: My order was not delivered, what should I do? A: Our delivery success rate is over 99.95%. Orders normally arrive within 5 to 10 days. In some special cases, orders can take up to 14 to 16 days to arrive. If you suspect your order is lost in transit, you may contact your local post office with the tracking number provided.